Precision machined with maximum strength. 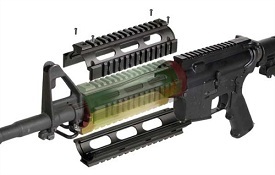 Four mil-spec Picatinny rails for versatile accessory applications. Simple and friendly installation, no gunsmith or tool required. Solid locking features for most secure fit. Ultimate tactical solution to enhance accuracy under toughest environments. Fits Carbine length AR-15 and variants. Made for a Firearm, but also fits TM & CA Airsoft guns!